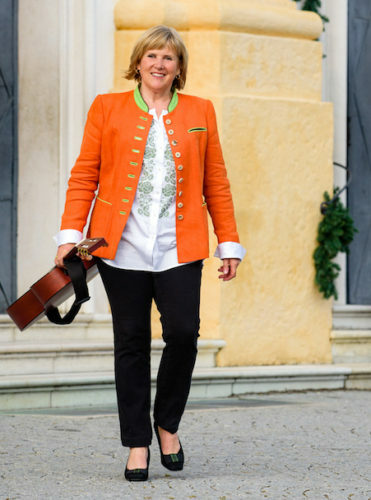 On Saturday, Oct. 13, at 7 p.m., Elisabeth von Trapp returns to Saint Ann’s Church to present A Concert for Breath a benefit supporting Yale University’s Lung Cancer Study and Research. All proceeds of this concert will advance Yale’s research and assist those who have non-small cell lung cancer. Von Trapp is a member of the family whose story inspired The Sound of Music and the “sounds of music” are part of her earliest memories. Building on her famed family’s passion for music, Von Trapp has created her own artistic style, at once, ethereal and earthy. Her musical repertoire ranges from Bach to Broadway and with equal ease she sings timeless melodies likes Rogers and Hammerstein’s Edelweiss, pop classics like A Whiter Shade of Pale and her own compositions. She has released five self-produced albums, and has performed across the United States, Austria and Russia. Her music has been featured on National Public Radio, BBC-Radio, Japanese National Radio and CNN Spanish Radio. She has appeared on CBS’s Eye on People, ABC’s Good Morning America and BBC-TV. For a portion of this special performance, von Trapp will be joined by the choir members of Saint Ann’s Church, who will be singing for the cure in honor of Eleanor Robinson, a parishioner, who is fighting non-small cell lung cancer. Admission for the concert is a suggested donation of $20 per person/Seniors $10 per person. Space will be limited and the doors open at 6:30 p.m. Audience members are invited to meet von Trapp at a reception immediately following the concert. Saint Ann’s is an Episcopal parish in Old Lyme, CT that, under the direction of the rector the Rev. Canon Mark K J Robinson, invites and welcomes all visitors to this family-friendly event. Live@SaintAnn’s is a concert series organized by the Music Committee of Saint Ann’s Church whose mission is to enrich the community and introduce visitors to the parish. Saint Ann’s is located at 82 Shore Road (Rt. 156), two miles off I95, Exit 70. Parking is adjacent to the church. For more information, visit Saint Ann’s online at www.saintannsoldlyme.org.